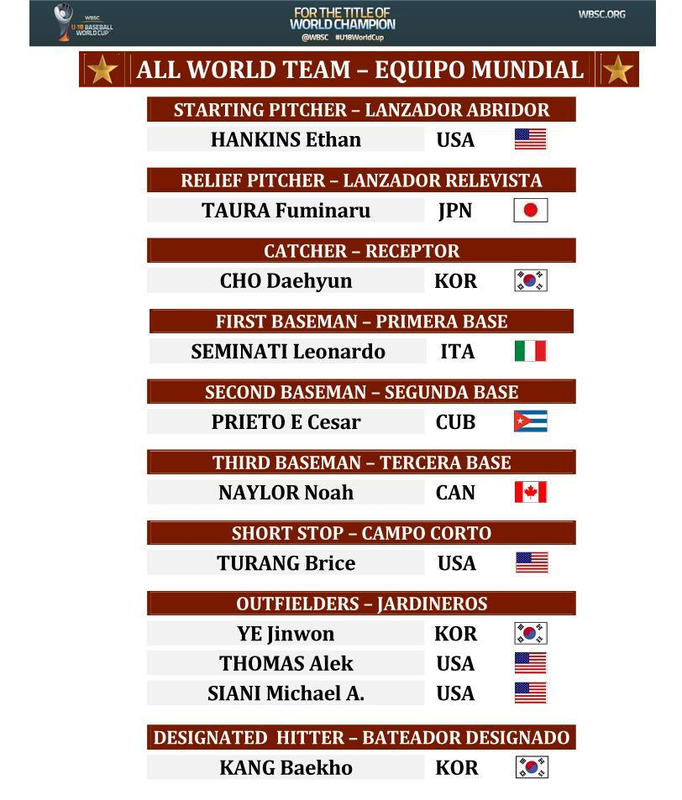 The United States have won their fourth World Baseball Softball Confederation Under-18 World Cup title in a row after beating South Korea in the final in Thunder Bay, Canada on September 10. The Americans eased to the gold medal after thrashing the Koreans 8-0 in the gold medal match at the Port Arthur Stadium. Neither side could make it onto the scoreboard in the opening stages and the match remained pointless after the second innings. The US soon showed their superior quality though and had all but wrapped up the title after the fourth innings. Three runs in the third and four in the fourth handed them a 7-0 advantage. Another single in the fifth inflicted further misery on South Korea, who could not score a single point of their own as the US ran out comfortable winners. The tournament continues to be dominated by the US, who were also winners at Seoul in 2012, Taichung in 2013 and, most recently, in Osaka two years ago. WBSC President Riccardo Fraccari opened the closing ceremony, congratulated USA on earning the gold medal, thanked and recognized the umpires, scorers, technical commissioners and Canadians and added “Our hope is to see some of these athletes in the next Olympic Games in Tokyo”. "The credit goes to our under-18 programme," said US manager Andrew Stankiewicz. Korea manager Lee Sung Ryul talks through an interpreter: “The American team was much bigger and stronger than we are. This always happens with western players, but I must admit these kids are also technically impressive”. Japan beat (8-1) Canada and earn a deserved bronze medal. Japan starter Ginji Miura proves to be almost unhittable for the hosts and leaves after 106 pitches (72 strikes, close to 68%) and the win secured. Canada get their first hit in the fourth and the second in the seventh, the last inning of work for Miura. Chinese Taipei missed to qualify to play for the Super Round and finished 7th in the Team’s Final Ranking, top of the Consolation Round. Triston Casas （USA） was an easy pick as the tournament MVP He singled, doubled and homered in his first 3 at bats.